The War of the Worlds begins with a tour of the hostile environment of each world of our solar system, leading to an explanation as to why the Martians would cast a longing eye on our planet hanging temptingly in the black void like a delicious blue and green kind of fruit, ripe for consumption. We learn from the narration that Mars is “in the last stages of exhaustion” and that the Martian civilisation is “searching for another world” to migrate to and that we have been “scrutinized and studied” by them for that very reason. 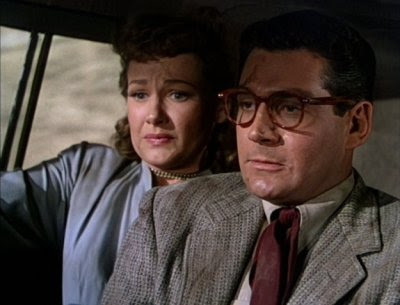 The story is set in early 1950s southern California where we find a Manhattan Project scientist, Dr. Clayton Forrester happily engaged in a fishing trip with his colleagues at Pine Summit when a large meteorite-like object crash lands near the town of Linda Rosa. At the impact site, Forrester meets the distinctively stunning Sylvia Van Buren and her uncle, Pastor Matthew Collins. He concludes that the object that crashed appears to be far lighter than can be accounted for by its large size. So, we know that there is something unnaturally peculiar about the object. Not only that anomaly, but it is also radioactive which spells danger! This strange feeling of discrepancy contrasts with the initial picnic-like atmosphere at the impact site where we see kids and dogs running around and pictures being taken. There are those who would consider setting the object up as an attraction and that it would be “a goldmine in our backyard.” As the object is too hot to examine closely, Forrester decides to wait in town overnight for it to cool down. Three men are left behind to guard the crash site. Later that evening, we witness a hatch on top of the object unscrewing excruciatingly slowly and falling away to reveal the emergence of a pulsating, mechanical, cobra-shaped head attached to the end of a long flexible neck. Notice how as this is happening, the three men physically withdraw by leaning further away and stepping back equally slowly. The three guards, however, do decide to approach with a neighbourly.“Welcome to California” and bolster their courage with the assumption that waving a white flag is a universal symbol of peace. Far from recognising this gesture as a sign of peaceful intentions, the cobra-head fixes them in its sights and fires a heat-ray, vaporizing the three guards, thereby ending their short-lived careers as would-be ambassadors for humanity. The Martian’s power and malice extends further with the cutting of the power to Linda Rosa. Strong magnetic effects are noticed with the magnetizing and consequent stopping of people's watches. It seems like the object is creating a strong magnetic field as indicated by the compass pointing away from magnetic north and in the direction of the crash site. Forrester and the sheriff are confronted by the Martian equivalent of a no-trespassing sign when they almost have their eyebrows singed off by the Martian heat-ray when they decide to investigate the weird happenings. Meanwhile, other meteorite-ships have been landing throughout the world. It is decided that the US military should surround the original landing site. 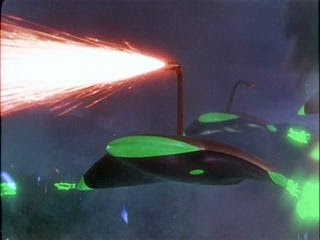 It is not long before three large manta ray-shaped vehicles rise from site and begin to slowly and menacingly advance. As this is happening, Pastor Collins, full of peace and goodwill but short on good sense, approaches the three alien craft, reciting Psalm 23 while holding his Bible aloft. 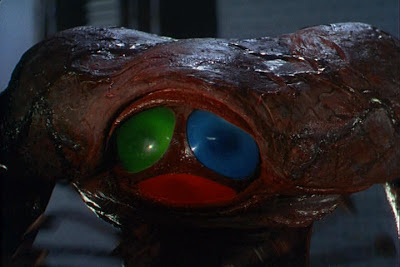 Seeming to take their cue from Revelations, the Martians smite him instantly! The large salivating Marine force surrounding the landing site unleashes enough destructive fire power to rival the power of the trumpets that blew down the walls of Jericho. It is all to no avail though as each Martian machine is protected by an impenetrable force field. The Martians then retaliate by using their heat rays forcing the puny humans to retreat with their tails between their legs. In Los Angeles, military leaders meet to brief reporters, devise a counter attack defence plan and prepare for an evacuation of major cities that will be threatened by the Martians. 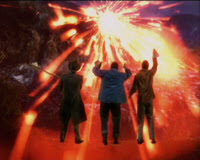 While all of this was happening, Forrester and Van Buren have managed to escape in a small plane, but later crash land, after avoiding colliding with other Martian war machines. They take refuge in an abandoned farmhouse but are trapped inside when (luck would have it!) one of the alien ships crash-lands, half-burying the farmhouse and rudely interrupting what looks to be a very delicious meal of fried eggs. Eventually, a Martian electronic eye attached to a long, flexible cable snakes its way into the ruined farmhouse's interior but soon withdraws after its inspection fails to find anything. This incident is followed by a lone Martian whose presence is registered in a study of terror when it places its hand on Van Buren’s shoulder. Just watch her eyes and reaction to this! Forrester, Viking-like, wields an axe and spoils that Martian’s entire day, as well as severing the thick, long cable of the electronic eye which had since reappeared. He then saves a sample of the Martian blood on Van Buren's scarf as well as the electronic eye’s camera housing. 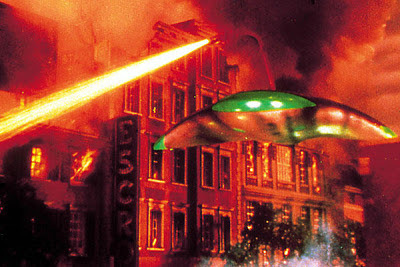 Forrester and Van Buren manage to escape as the Martian craft machine destroys the farmhouse. Forrester and Van Buren eventually meet up with Forrester's co-workers at Pacific Tech in Los Angeles. The retrieved blood sample and the electronic eye's optics enable the scientists to determine critical facts about the Martians’ physiology. Firstly, the Martian creatures would lose an arm-wrestling competition with us as they are comparatively physically weaker than humans. Secondly, they need a course of iron tablets as they have anaemic blood. The only ace up the military’s sleeve that seems to be left is to make use of atomic weapons. To this end, a United States Air Force Northrop YB-49 Flying Wing bomber (a real treat to be able to see these old planes in the air even if it’s just on film!) unloads an atomic bomb on the three original Martian machines. Even the most destructive weapon ever conceived by humanity’s warped and evil genius has no effect, due to the protective impenetrable force fields surrounding the machines. The Martians happily continue along their piece of the path toward global destruction while orders are given for the immediate evacuation of the city. It is determined that the entire Earth can be conquered in just…..significantly and ironically…. six days……..
With all seeming to be lost! With humanity finding itself helpless against the Martians! With Los Angeles under attack and reduced to burning ruins! What is to be the fate of humanity? To just wait for the inevitable end? Find out by watching the epic battle for survival in….. 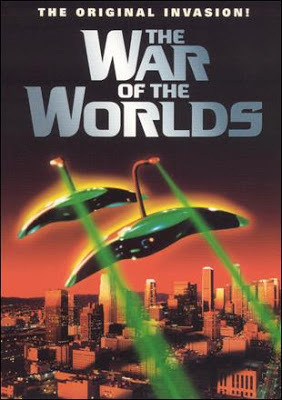 This film version of The War Of The Worlds is not a literal presentation or interpretation of the H.G. Welles classic story. It nevertheless does it justice and it was a sensible decision to make it relevant for a 20th century audience. The 2005 remake starring Tom Cruise was also a good move for a 21st. century audience. However, it takes a special something for a film like George Pal’s 1953 film to resonate with film viewers and be considered as a classic after 60 years. Remember, this film was made long, long before the current age of CGI effects. The film opens with a prologue in black and white and abruptly switches to Technicolor during the opening title sequence. This clearly takes the viewer into the modern brave new world of “terrible weapons” and the creations of science that menace mankind. This is a new age unlike anything experienced in our past. The California city of Corona was used to depict the town of Linda Rosa. In addition, Los Angeles’ St. Brendan's Catholic Church, was used as the church where a large group of desperate people gather to pray in the film. It is one of the scenes where the tension is palpable as we witness and feel for the surviving populace huddling in the church as buildings crash and burn around them. 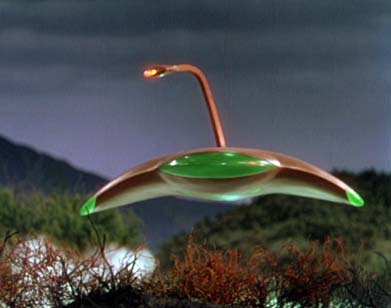 Departing from the stereotypical flying saucer shape of UFOs, The Martian craft were designed to be sinister-looking machines shaped something like a cross between a manta ray and a swan hovering above the ground. The total effect is that the machines are both beautiful and terrifying. They move slowly and gracefully as if alive but more significantly, they move in a menacing, implacable and calculating manner. 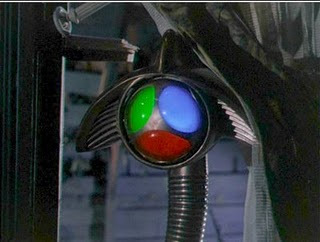 Each Martian machine is equipped with an articulated metal neck which in turn has a cobra-like head attached to it, containing a single electronic eye that serves as both a periscope and an energy weapon. Notice how the "eye" seems to exude cruelty as peers down on the puny priest, as if studying a microscopic specimen which it is about to exterminate once it has completed its examination. The sound effects for the green ‘skeleton beam’ and heat ray rays was created by making use of such things as violins and cellos, striking a high tension cable with a hammer and mixing the sound of electric guitars being recorded backwards. The Martian's scream in the farmhouse ruins was created by mixing the sound of a microphone being scraped along dry ice, combining this with a woman's recorded scream and then reverse-playing it. In the original HG Wells' novel, walking tripods featured as the alien preferred mode of transport. For the film, an attempt was made to make the Martian machines appear to float in the air on three invisible legs by making use of downward lights added directly under the moving Martian machines. Due to technical difficulties, this effect only appears on one of the first machines rising from the Martian's landing site. In other scenes, three invisible leg beams create small, sparking flare-ups where they come into contact with the ground. I previously mentioned the scene when the Martian crept up behind Van Buren and clamped its sucker-like fingers on her shoulder. I referred to this as a study in terror. Notice how she freeze-pauses and then only her amazing eyes react to the alien’s touch. This is then followed be her slowly turning her head around and staring in horror at the violating alien digits. It takes a few slow seconds for Van Buren to comprehend what has happened. 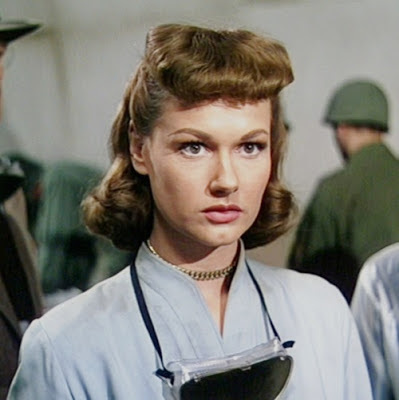 Far from being a wooden character, the Van Buren character has an amazingly beautiful and expressive face that easily reflects her emotional states throughout the film. Earlier we see the realisation of what has happened slowly dawn on her face when she is in Forrester’s arms after the plane crash. 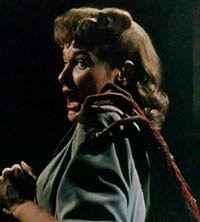 In the farmhouse, when the Martian electronic eye on its long neck snakes its way closer to the besieged couple, we are drawn to Van Buren’s beautiful terror-stricken eyes, as her eyeballs slowly swivel around, followed by her head in the direction of the sinister serpent-like surveillance device. Later, her terror is palpable as she stares into the Martian lens at the lab. It is as if her face and eyes have become one of the main vehicles in the film with which to convey the story’s sense of fear and terror. Dr. Clayton Forrester may appear to be a wooden character at times, but he seems to be more like an island of calm and good sense in a surrounding sea of surging emotions, panic and hysteria. In a time of prolific smoking, he declines an offer of a cigarette with a “no, I don’t smoke.” This man is no sheep who moves with the flock. Instead of jumping to wild conclusions about the presence of the strange object, such as its being “an enemy sneak attack,” he employs reason and the scientific method to determine its nature and purpose. For instance, Forrester concludes that the facts don’t add up about the object and how it came to land considering its size and the impact it made. This suggests to him that it must be both hollow and light. Later on he uses science and observation to determine that the object is responsible for their watches being magnetised and he uses a compass to locate from which direction the magnetic disturbance originates. Forrester also theorises that the Martian’s ray disrupts the atomic structure of matter and they can generate atomic force to power their rays. In contrast to both Forrester and the army, we have Pastor Dr. Matthew Collins and his attempt to deal with the presence of the “beings from another world.” This is best summed up when he tells the general, “Shouldn’t you try to communicate with them first and shoot later if you have to?” For Pastor Collins, it is more important to “try to make them understand that we mean them no harm.” The fatal flaw with this once again lies with an assumption: “It they are more advanced than us, they should be nearer to God.” I think deep down inside he realises this when he says to his niece, “I like that Dr. Forrester, he’s a good man.” This sounds like a good-bye as all he has is his faith as he is about to “walk through the Shadow of Death” unafraid of the “evil” he is about to meet, armed only with his bible, the symbol of his faith and the word of his God. As the scientists evacuate, they become separated during the widespread panic among the fleeing populace. Humanity shows its worst face as a rioting mob steals Pacific Tech group’s trucks and destroys their essential equipment. The scene showing the man with the suitcase full of money who tries to buy his way onto a truck during the evacuation of Los Angeles, demonstrates what happens when hope and faith appear to be lost. Desperation and personal survival can become the order of the day when people are placed under stress and live in fear in a world where “you can’t buy a ride for love or money” anymore. Rob people of their sense of security and well-being and the veneer of civilisation could soon crumble. Forrester knows exactly what one certain person will do in the face of civilisation’s impeding demise when he declares to the two military policemen on the deserted streets of LA, “She’s kinda lost but I think I know where she’ll be.” He eventually finds Van Buren in a church and as this last edifice of faith crumbles from the alien onslaught, we find both Forrester and Van Buren clinging to each other in the final act of faith and hope; their love for each other. Right at that point there is a crash and everything goes silent. The silence itself is almost as shocking as the previous noise of destruction. 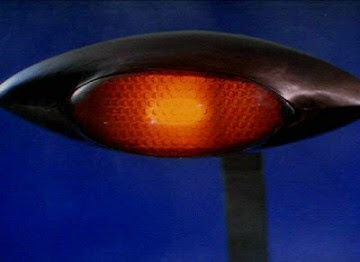 The excruciatingly slow emergence of the alien presence earlier in the film signalled the hostile intent of the Martians. Now at the end of the film, we witness the equally slow emergence of a Martian’s hand and arm as it gradually inches its way out of the crash craft’s opening. Is the Martian somehow appealing for help as its life gradually ebbs away? Or is this simply a dramatic device to show the effect of the bacteria on the invader? The film was nominated for three Academy Awards, winning an Oscar in the category Special Effects and was later selected for inclusion in the National Film Registry of the Library of Congress being deemed culturally, historically, or aesthetically significant. 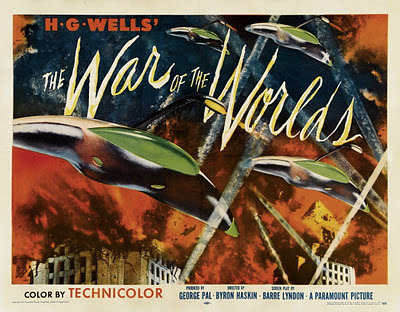 No doubt there will be other remakes of The War of the Worlds in the future, but I am sure they will all in some way pay homage to both George Pal’s brilliant screen sci-fi masterpiece and to the brilliance and timelessness of Mr. Wells’ original concept and story.